The 8th Word Wonder! 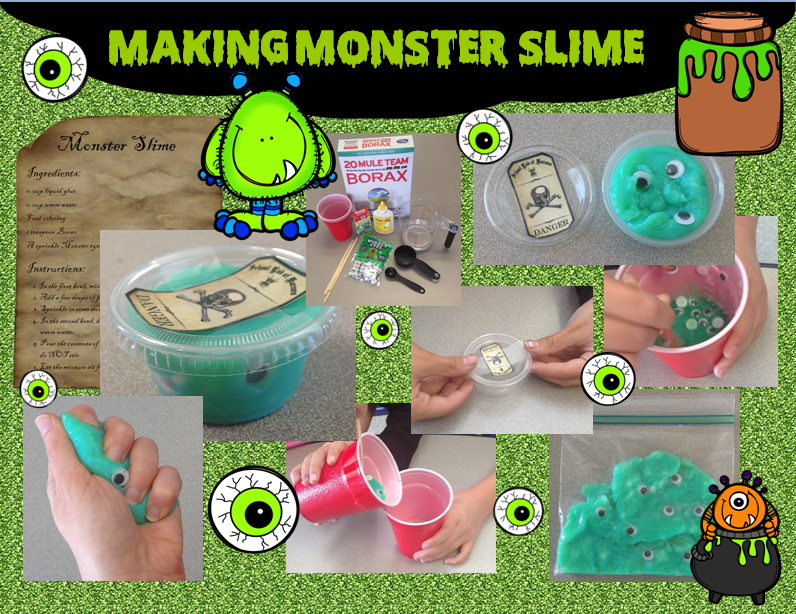 Speech & Language Therapy Blog: Monster Slime! After having been out sick with a cold yesterday (courtesy of some of my Speech kiddos, I'm sure...), the Halloween festivities are continuing this week in my Speech room. 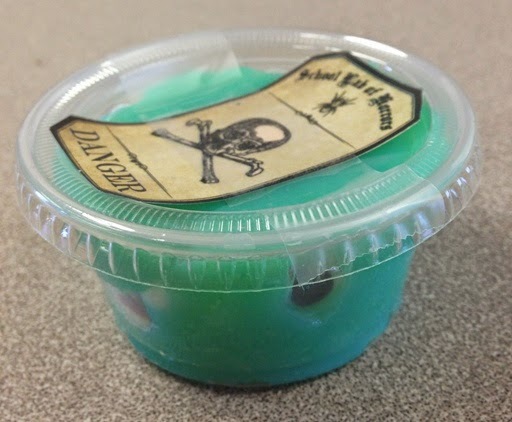 I am doing a very special activity with my 4th/5th graders in the same vein as my Witches' Brew potions: we are making Monster Slime! The ingredients are inexpensive and readily accessible, which made this activity relatively easy to throw together. Using the template of my Witches' Brew recipe, I copied and pasted this slime recipe. In addition to these ingredients, we also added craft googly eyes to increase the creepiness factor. I made sure to go over safety with my students when handling Borax -- because of this key ingredient, this activity works better with older students, and adult supervision is required. As with the Witches' Brew, this was a great introductory lesson to using measuring cups and spoons. We didn't have bowls, so we used two large plastic cups instead. We also made sure to use warm water, so that the glue and borax would dissolve more easily. Students worked as a team to follow and complete the instructions in the recipe. Once we had made our slime, we transferred it into small Dixie containers and taped on these cool FREE labels from TPT. You could also place the slime in a plastic Ziploc bag. Of course my students got to take their creepy creations home. We talked about vocabulary, such as "ingredients, measuring, add, mixture, consistency, texture, stir, dissolve, label, toxic, sprinkle, liquid," etc. This was a fun and motivating lesson for the kids, and taught useful life skills. And we made some great memories, too! I think this recipe would be even more fun if using the glitter glue by Elmer's, but it is $3 per bottle. Maybe adding glitter to the mixture would work? Another fun variation would be to use red food coloring and calling the mixture "brain matter". Gross!